Waikerie is situated on the banks of the beautiful Murray River, a mere 175 kms from Adelaide. Enjoy the winter sunshine or summer tranquility by turning into Waikerie from the Sturt Highway between Blanchetown and Barmera or head towards Morgan and Cadell west of the town. The name Waikerie is said to mean 'many wings', after the giant swift moth 'wei kari', the name given by the original indigenous community. It's an appropriate name, considering the teeming birds of the lagoons and wetlands that edge the river. Waikerie was established in 1894 when its first settlers arrived by paddle steamer. A town that offers a wide choice of restaurants, accommodation, hospitality and shopping. Waikerie has developed from a lengthy affinity with 'Murray River matters' and the ensuing beauty. For more than a century, travellers have been welcome to use facilities that have now developed into a thriving country town on the Murray. Broad acre farms, vineyards and citrus groves cover huge areas of agricultural development, sending thousands of tonnes of quality produce to Australian and overseas markets. Thousands of appreciative visitors annually enjoy a climate that challenges any other in Australia. Waikerie accurately boast more sunshine hours yearly than the famed Queensland Gold Coast! The district is full of wildlife, natural history and ecological attractions that are very hard to surpass for beauty, selection and availability. Brilliant weather all year round ensures a most desirable climate for outdoor activities during short or long stays. 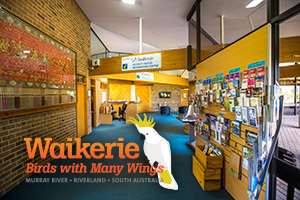 Waikerie is a centre that caters to the interest of a wide variety of both visitors and residents alike. Waikerie was first settled in 1894, and consists of well over 5,000 hectares of agricultural, horticultural and viticultural developments - plus excellent conservation, parklands and wetlands. The farming community they founded is now surrounded by over a million fruit trees, and the town is truly the centre of citrus and fruit industry in South Australia. Here, you'll find one of the longest stretches of accessible riverbank and the width of the river makes it popular for water sports and fishing, and suitable for houseboats. The town is also justly proud of its 18-hole, bunkerless golf course. The town's Santa's Cave at Christmas time is especially fun for families. In recent times, the birds have been joined in the skies by gliders, with pilots worldwide raving about the thermals on which they soar. The best way to understand their fervour is from the front seat of a glider: the Waikerie International Soaring Centre arranges joy flights - and as a bonus the views of the river and waterways are inspiring. Approximately 60km north from the town is Gluepot Reserve, renowned for prolific birdlife and great camping. Before heading out on your walk visit the new Michael Hyde Interpretive Centre on site, to get all the information you need for a great wildlife experience. This 2 kilometre clifftop walk stretches eastwards from the Waikerie Ferry through the Pumping Station grounds to the lookout and then along the picturesque cliff top. There are excellent river views and don't forget to take your camera. The ferry crossing at Waikerie is one of the few remaining on the Murray. A trip across the ferry and a turn to the right will take you on a clifftop scenic drive of the river with great views. Behind the Rainmoth Gallery (a local artists' and craft workers' outlet) are the beginnings of the new Interpretive Park - an opportunity for the kids to interact with the science of irrigation. A fauna reserve located near the Caravan Park allows close contact with Australian animals. Open every Sunday from 1:30 to 4:30 pm. Closed Christmas and New Year's Day. The first white person to venture through this area was Captain Charles Sturt in 1829. From 1838 to about 1860 many sheep and cattle were brought overland from the Eastern settlements to supply meat and stock for the new Adelaide Town and growing population of South Australia. Mostly these animals were herded along the northern banks of the Murray following the river round where Morgan is today. Aborigines who lived along the river then were of the Ngawait tribe. The river and surrounding land provided everything they could possibly need. There were fish, shellfish, birds of all kinds, kangaroos, native fruits and seasonal delights such as the "Waikerie" grub and moth. The Giant Swift Moth (Trictenna Argentata) now known locally as the Rain Moth, because of its habit of emerging from its cocoon in the earth following late autumn rains, was called "Waikerie" by the Aborigines who dug them from the ground or caught the emerged moth as it flew around their camp fires at night. From about 1856 for 60 odd years paddle steamers turned the river into a busy highway as they carried passengers and goods to inland centres and produce, wheat and wool away to Morgan or Goolwa and overseas markets. In 1894 eleven Village Settlements were begun on the river in S.A. Enormous hardships faced these pioneers (some of which have been documented in Jean Nunn's "History of Waikerie" available from the District Council office). For the Village Settlements of Ramco, Waikerie and Holder the boats traveling along the river were their lifeline to outside civilization. No roads came near the settlements then. During emergencies if the river was too low for boats to run, someone had to walk north to the Morgan, Wentworth road and stop the passing coach. From the town's lookout you can see towards the west orchards which were amongst the first planted by Village Settlers. The all electric Pumping Station at the foot of the cliff was built in 1965 to replace diesel pumping units which had in their time replaced the earlier steam engine and pump. Waikerie is the only village settlement on the river to emerge as a major town with its own hospital and schools. Today the district of Waikerie covers an area of approximately three thousand square kilometres. Approximately five thousand hectares are irrigated producing wine grapes, citrus, almonds, fresh and dried stone fruits, tomatoes, rockmellons, vegetables, avocados, olives, persimmons etc. When you're following the Discover Murray Trail. Give yourself a great day to relax in Waikerie. YES! We are heading west!